Burke is one of the most cold-blooded yet strangely honorable heroes in the history of crime fiction, an outlaw who makes his living by preying on the most vicious of New York City's bottom-feeders, those who thrive on the suffering of children. 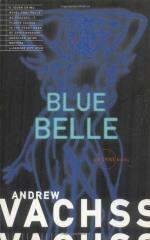 In Andrew Vachss's tautly engrossing novel, Burke is given a purse full of dirty money to find the infamous Ghost Van that is cutting a lethal swath among the teenage prostitutes in the hood. He also gets help in the form of a stripper named Belle, whose moves on the runway are outclassed only by what she can do in a getaway car.